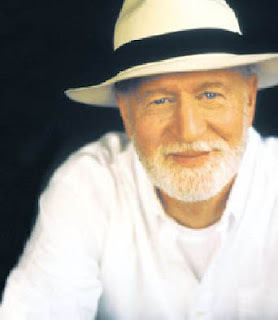 Mose Allison was a highly innovative jazz singer/piano player from the Mississippi Delta in Tallahatchie County. He started recording music in the late 1950's. His music, an ultra-modern fusion of jazz and blues, was way ahead of it's time. The lyrics are very cynical and pessimistic, in stark contrast to the mid-to fast paced jazz/blues. The music does convey a certain sense of helplessness though. It is in a minor key, and conveys the feeling of being caught in a world spinning out of control. Mose Allison's vocals are highly detached, almost spoken, and are a desperate cry for help in a world that is too fast paced for people to notice what is going on around them. His dry style is somewhat similar to the vocal delivery of Tom Waits. He has influenced a huge range of artists, from Blue Cheer to The Rolling Stones. 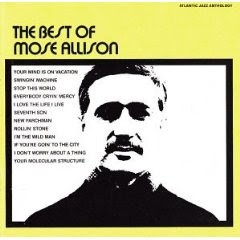 A great place to start if you're curious is the 20 track CD "The Best of Mose Allison". Every track is great. You can't go wrong with this one. Here's "Stop This World" and "I Don't Worry About a Thing", two of my all time favorite songs. Hope you like 'em. Going on the xmas list.